The dosing devices for liquids are independent devices, which are normally mounted to the packaging machines and work together with them. The main function of the dosing device is the separating of the product into predefined doses, which are set by the machine operator. The ready doses are then fed to the packaging machines. This operation is mediated by the valve box (distributor), which switches from a mode for loading the piston to a mode for dosing the loaded volume of product. The volume of the dose can be regulated by changing the pace of the piston. Adjustment of the dose volume YES. 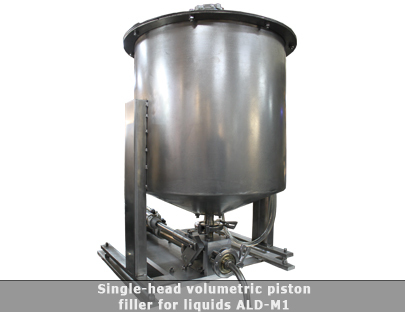 Hopper Double-layer hopper with water jacket with mixer for product tempering.